I wanted to cover a few things that I see coming up again and again, without there being a lot of great answers available. The first would be whether or not your dog really needs for you to be their pack leader. Do I really need to be my dog’s pack leader? Let’s run through the things we already know. Dogs are pack animals. Within a pack, there will always be leaders and followers. There is no changing that, it’s just how dogs work. And it’s been working quite well for many many years. The relationship isn’t a difficult one to understand. The leaders make the decisions and the followers follow. Not complicated. In the wild, dogs are pack animals. They descended from the wolf, another pack animal. But most people don’t realize how closely we mimic those relationships in our world. At home, you and your dog have formed a pack. There may or may not be other members of your pack. Children, other dogs, and *gasp* maybe even a cat! Dogs have had it bred into them for thousands of years to see these people and other animals as part of the same pack. And in their eyes, the leader of the pack makes all the important decisions. In a lot of homes, you’ll find dogs that want nothing more than to please. They will do whatever you ask. They eagerly and quickly learn when being trained. And their owners are sure that it’s all because they’re such a great owner. Chances are, you know someone like this. How can their dog be so easy and receptive to training when the owner doesn’t seem to even be trying? Just thinking about it is probably getting you annoyed. Why is it like that? How is that fair? Well, it’s not anything the owner is doing, it’s just the simple matter that some dogs are easier to train than others. That’s it! It’s so common to see dog owners who have been getting away with improper training for years — because they lucked into an “easy” dog — thinking they knew exactly what they’re doing. And they’re probably all too eager to tell others what to do with their dogs, when in reality the great relationship they have with their dog is nothing more than dumb luck! But if you have a very smart but difficult and determined dog than you have to fully understand everything you do and the message that sends to your dog. Your dog is going to be incredibly tough to train if you don’t go about things the right way. The secret to training these smart but driven dogs is… you must be sure that YOU are the pack leader in the home. Then — and only then — will they listen to you. Surprisingly, the difference between these easy and difficult dogs doesn’t come down to breed. It’s all a matter of the individual dog’s character and personality. And you can’t tell that until they’ve already made themselves a part of your home. But hopefully that is helping you to see why you have been struggling with your dog. It’s why you feel like everything is a battle, or that you have to bribe them every time you want them to obey. And it’s all because in your dog’s mind, you are not the pack leader… YET! Do I have to be aggressive to be my dog’s pack leader? No! All the screaming and posturing that used to be associated with being pack leader was written off as out of date years ago. The best pack leaders are calm and consistent. There’s no need to scream, shout, or swat when you are firm but fair with your dog. The best dog training happens when we have won our dog’s mind through leading in a calm and gentle way, so that our dog accepts us as their pack leader by choice and not by fear. Applying human psychology to dogs just does not work. But by understanding how our dogs view the world we can change the way we communicate with them so that they receive our messages in a way that makes sense to them. You must accept that there are huge differences in human and dog psychology that have been ingrained into each of our mind’s for thousands of years. The differences are small but crucial. Once you understand your dog’s mind there will be no need to be aggressive with them during training. And if you have been struggling with this, it is very likely that it is because your dog does not see you as the pack leader. One of my favorite dog training sites concentrates on this very subject. 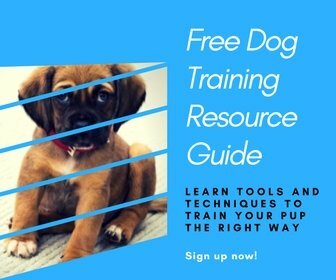 The trainer Dan has an excellent free video series that will take you everything you need to know to take control of your dog and become their pack leader. There’s much more to this, and most people learn better by watching rather than reading (I know I do). If you’d like to see a little more on these subjects and much more, take a look at Dan’s video series on his site The Online Dog Trainer. P.S. Make sure to pin this in case you need a refresher later on!